Plant taxonomy classifies Victoria Blue salvia plants as Salvia farinacea 'Victoria Blue.' That last part (in single quotes) is the cultivar name. A common name for these plants is "mealy-cup sage," a term that comes from the fuzzy look of the flowers of its wild ancestor. Another common name for them is "flowering sage." Victoria Blue salvia plants are herbaceous perennials in their native Texas and Mexico. But, in northern climates, they are usually treated as annual plants, due to their lack of cold-hardiness. They belong to the mint family. 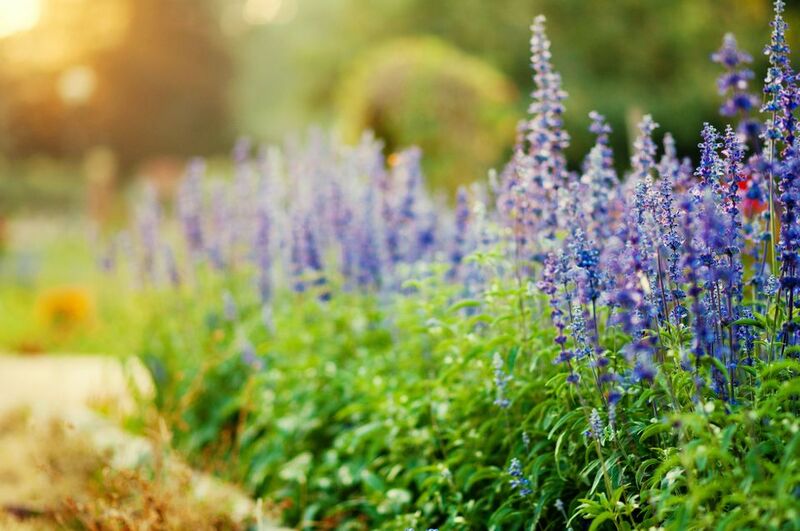 Victoria Blue salvia plants reach about 18 inches tall, with a spread of about 12 inches. The deep blue flowers run up and down flower spikes that are commonly as long as 8 inches, thereby giving them a lot of pop in a landscape design. The foliage is also pretty, being a grayish-green; the leaves are lance-shaped. This type of ornamental sage can be made to bloom all summer long with proper care. Take advantage of this long-blooming quality and use the plants to fill holes in your sequence of bloom. The deep blue color of Victoria Blue salvia's flowers is no doubt the plant's best feature. Deep, almost true blue (as opposed to the more purplish blue of many perennial salvias) is a highly sought-after color in flowers, especially in the U.S., where people seek red, white, and blue floral color schemes for two holidays during the warm-weather months: Memorial Day (in late May)​ and Independence Day (July 4). Ideally, you will want to grow these plants in a full-sun area (in the North) with a well-drained soil. The farther south you are, the more advisable it becomes to grow them in partial, not full sun. The plants will reach their full blooming potential only in a spot with full sun in USDA planting zones colder than zone 7. While it is not ideal, they will tolerate clay soil to some degree. Although they are drought-tolerant perennials once mature, do not forget to water young plants, which have more trouble with dry conditions. Since they last only one growing season in the North (which is not long enough for them to become mature), this means Northerners will have to water them regularly if they expect to get a good display of blooms. These plants should not need fertilizer if you have worked compost into the soil of your planting bed in the last few years. Victoria Blue salvia flowers are cold-hardy to USDA planting zone 7. Plants brought home from the garden center should be installed in the ground only after all danger of frost is over in your area. It is a good idea to deadhead them if you are striving for the best flowering display possible. Some gardeners prefer to let the flowers go to seed, hoping for naturalization, in which case they will avoid deadheading. Divide them in spring if you are growing the plants as perennials and you wish to gain extra plants for use in other areas of the yard. Provide your plants with good air flow by giving them enough space (do not plant them tightly together). Good air flow helps the foliage dry off after it rains. Since plant width is up about 12 inches, space about 16 inches on center in a mass planting of Victoria Blue salvias if avoiding powdery mildew is your goal. When watering, do not spray them from overhead. This gets the foliage wet and invites fungus. Instead, run your garden hose so that the water is directed at the base of the plant, at ground level. Because of their showy, long-lasting flowers, they are often treated as bedding plants and massed together to form a "sea of blue," especially in the North. In round container gardens, install a Victoria Blue salvia plant in the middle, and let shorter plants in complementary colors trail over the edge. For those who like to bring the garden inside, the flowers can be used in cut-flower arrangements or dried for a longer-lasting display. They are also suitable for cottage gardens. Coneflowers (Echinacea), especially orange and yellow types. Stella de Oro daylily (Hemerocallis 'Stella de Oro'). In terms of their relationships with wildlife, Victoria Blue salvia flowers attract hummingbirds. Plus they are plants that attract butterflies and bees (bees tend to be drawn to flowers of a blue color). Luckily, they are deer-resistant perennials..